Body art and tattoos have been a fad globally for many years now, but have you heard of the latest buzz in the fashion scene… called the “Tattooth” or tooth art? Yes, you can now get tattoos on the teeth and make your smile look cute, or get that naughty glint as you flash a smile like a pirate. These tooth tattoos seem to be a kind of quirky, yet funky trend all over the world and is now evolving into a rage in Japan. The trend is also now getting popular in the US where people can be seen sporting temporary tattoos on their teeth. Steven Heward is a fine artist who used his unique talent on teeth to become a pioneer of this tooth art form called the “Tattooth”. He began designing on false teeth in a mini lab and has inked about 500 teeth since then. The images range from animals, celebrities, logos, letters and any other art form that you so desire. The Heward Dental Lab that is known world wide for its quality crown and bridge work now also trains tooth artists to apply custom hand painted tattoos on a porcelain crown for your tooth. The process of getting a tattooth is quite simple really. You can choose whether you want a permanent type or a temporary stick-on kind. 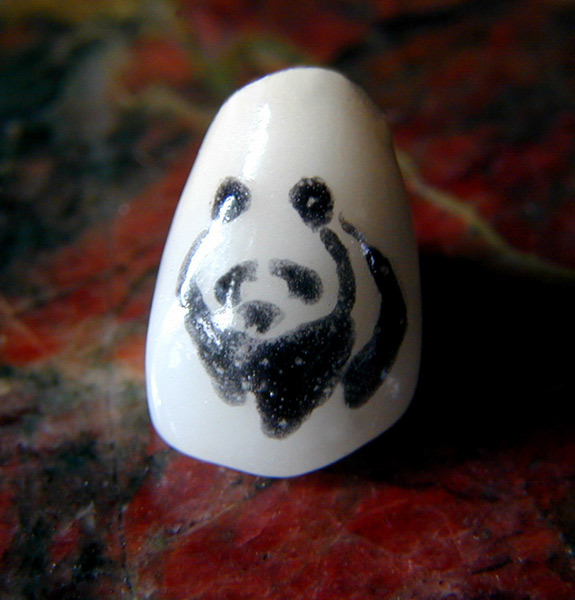 The permanent type is done by etching the design on the false tooth, which is then sealed with the help of a glaze. Later, the dentist simply incorporates it on a set of teeth. The temporary kind, which is very much in vogue now, is similar to nail art that can be just stuck on the tooth and removed at will. The permanent tattoo can also be removed easily, whenever you like, by simply grinding it off the crown. There are absolutely no risks involved in getting a tooth tattoo, especially if you already have crowns on any of your teeth. For those who don’t, it involves grinding a tooth for preparation of a crown, almost like getting a tooth filling. And it requires no aftercare either, other than regular brushing and flossing. “A drop of chemical (mild phosphoric acid) is put on the tooth and then the tattoo is stuck on it. The other one is a set of tattoos (a design placed on the set of teeth). A minor procedure is done to set the teeth so that the tattoo can be placed. Usually, if a patient has a decayed tooth or has the tendency for tooth decay, I recommend they don't opt for tooth art. There is no risk involved if one gets teeth tattoos. I have done around five teeth tattoos. The clients who come are generally teens who are majorly influenced by rap culture. There's no specific precautions one needs to take, apart from cleaning tattooed teeth and brushing regularly,” says Dr Sagar Rao who is an orthodontist. ****Dr. Priya Kanwar is a featured writer for health on Xomba as well as on technorati.. Since the time that stem cells were discovered about fifty years ago, by Leroy Stevens, it has been a hot topic for research among the medical fraternity as it opened out a whole new scope and potential for treatment and effective cure in various diseases and conditions. In the beginning, the focus was more on embryonic stem cells (cells derived from embryos) as they were pluripotent, which in simple terms means that they are capable of regenerating into any type of cell in the body, for e.g. muscle, bone, cartilage, skin etc. Later, research on adult stem cells generated a great deal of excitement as the scientists found adult stem cells in many more tissues than they once thought possible. It was not long before highly potent embryonic stem cell research became controversial for reasons of ethical and safety concerns and the adult-derived stem cells were deemed less pliant and less able to transform into the stem cells that science is looking for to find a breakthrough in the treatments for disease. A recent research study has found the exception in the stem cells of oral mucosa, the membrane that lines the inside of our mouths. They found that the cells did not seem to age along with the rest of our bodies, which could prove to be the breakthrough that science was hoping for. The study was conducted in a lab in Tel Aviv University’s Goldschleger School of Dental Medicine where Prof. Sandu Pitaru and his graduate students Keren Marinka-Kalmany, Sandra Treves, Miri Yafee and Yossi Gafni managed to successfully collect cells from oral mucosa and manipulate them into stem cells. Prof. Pitaru discovered that the oral stem cells were as easy to manipulate as the embryonic stem cells, even though they were taken from the adult tissues. His research has opened new doors and possibilities to the stem cell research and potential therapies for various neurodegenerative, heart and autoimmune diseases, as well as diabetes. In the study, Prof. Pitaru tried to determine if the oral mucosa could be a source for young, fetal-like stem cells with this unique healing ability. He says, “Even when obtained from an older patient these stem cells still have properties of young or primitive stem cells, which have a high capacity to be transformed into different tissues.” Prof. Pitaru and his team of researchers have already succeeded in coaxing the oral mucosa stem cells into becoming other significant cells, including bone, cartilage, muscle and even neurons. This research study has provided a safe and effective alternative to implanting stem cells into various tissues in a person, as the threat of rejection of the implanted cells is removed, as compared to patients who are being treated with implanted embryonic stem cells in which case they are required to take immunosuppresant therapy and moreover the embryonic stem cells also have the potential to form tumors. However, this study is still in the pre-clinical trial stage where the stem cells are being implanted within small rodents and they are researching the impact of the innovative cells as a treatment for chronic heart failure, neurodegenerative diseases, inflammatory autoimmune diseases such as Crohn's disease, and diabetes. As the above mentioned diseases are most likely to affect the elderly, the oral mucosa stem cells would offer a more safe and effective alternative to both embryonic and adult-derived stem cells. Prof. Pitaru says. "Stem cells taken from the tissue of elderly patients have growth limitations and reduced functional capacities."